Have you had trouble with group projects? 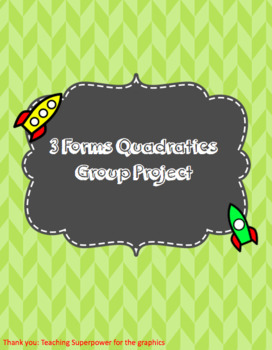 This project helps with the common problem in group projects, accountability. In this project, each student is held accountable and they are also encouraged to work together. The key is how you grade this. 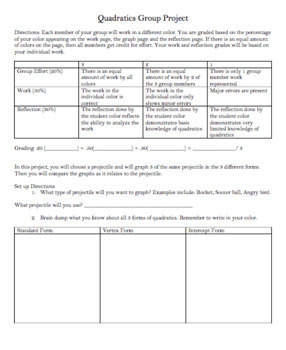 The rubric is in the project for you and students to see. 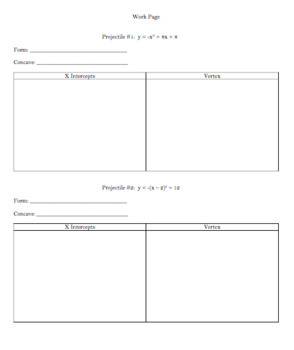 In this project, the group (preferably 3 students) graph 3 equations that represent projectiles. Each equation is in a different form. 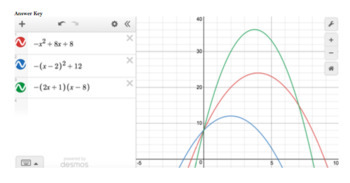 Students graph all 3 equations, create a landscape for their projectiles and answer analysis reflection questions. Students are able to choose what part of the work that they can complete and which analysis questions they can answer for their group. That is what makes this work and encourage students to contribute. We have done this project several times and I always get spectacular work from groups.